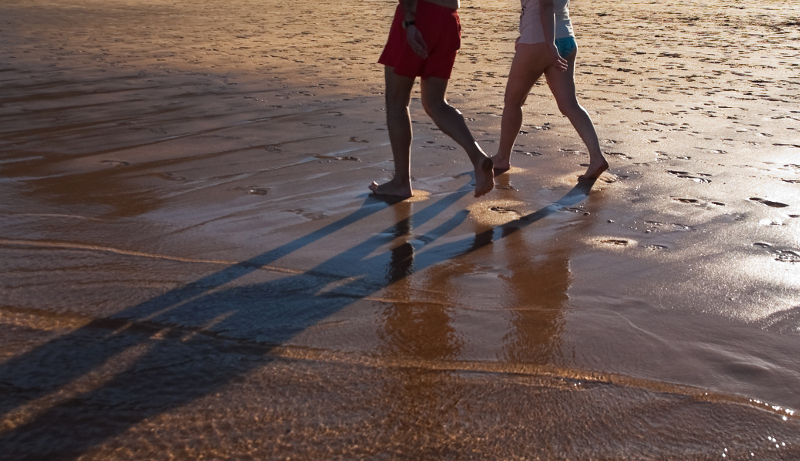 Walking is another way to enjoy the beach doing exercise in the open air. It's an easy activity full of positive aspects to our health. The key to get the most out of these benefits is the regularity. Additionally, walk in Las Teresitas, is a wonderful form of fighting stress while we stay in shape. In order to prevent stiffness start walking on the wet sand then, if you want, continue on the part of the beach with dry sand. When you use sunscreen don't forget your feet, in special the instep, which is the area most prone to get burned. Walk barefoot in contact with sand. This promotes relax and enhances the benefits of this magnificent natural exfoliating. If you decide to use beach slippers, make sure that they are securely attached to your feet in order to prevent falls. If you have flat feet, experts recommend walking into the water, since in this area, the land has less slope and diminishes the risk of injury.